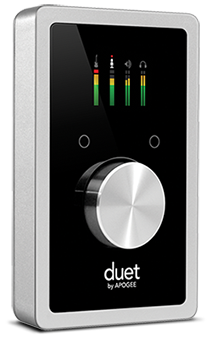 In this tutorial we will discuss using Maestro’s low latency mixer with Duet. When to use it, and how to use it when it’s needed. We will demonstrate this with Duet on the Mac, but the steps are pretty much identical if you have Duet connected to iPad or iPhone. Maestro looks a bit different on the iPad or iPhone, but functions the same way in both versions. If you are currently monitoring through your recording software… and you experience a delay between the signal you input and what you hear through the monitors or headphones… the first thing to do is adjust the buffer in your recording application. If you are not certain on how to change this in the software you are using, you can check out our getting started tutorials we have on our YouTube page or contact your software manufacture. The Lower the buffer, the lower the latency. However, If you set the buffer too low and you hear distortion or crackling, the buffer needs to be raised. If your system gets over taxed by either the session being too large or the computer is perhaps older and slower, you may end up having to raise the buffer to a size that will cause audible latency… And this can vary greatly depending on the system you are working on, and the session you are working on…This is when you will need Maestro’s low latency mixer. First turn off “Software Monitoring” in your recording application. Open Maestro and click on the “Output” tab. This sends the signal from the Maestro mixer to Output 1&2 where you would typically have your speakers connected. Now click on on the drop down under the headphone out and select “Mixer” here as well. Now select the “Mixer” tab. These channels have nothing to do with level being recorded… they are simply for monitoring purposes. As you can see here… when the levels are turned down in the Maestro mixer… the level going to the recording app is still the same. Now just simply adjust the level between “Software return” and the Inputs. And begin recording latency free.